Well, you’ve got to tell us your feedback on it in a few months, to see the real deal! Enjoy the new gadget! Good choice, I’ve been thinking about the Touch vs Classic subject a long time. But I’ve heard that there was a couple of problems with the touch. And why even go with 16gb when you can get 160gb instead. It’s only fancy touch screen. Good choice. Give us your review of it later ;). Nice man! I have to admit that I almost forgot about the classic one with all the rave going on about the Touch and of course the iPhone. Don’t want the nano, cause it’s square and kinda ugly. Don’t want the classic, because, lets face it, it’s old hat next to the iPhone and Touch. Also, it’s called “Classic”. I want my mp3 player to be cutting edge, not classic. I don’t want the iPhone (not that I have that choice yet), before they make a version with 3G and at least 16 gig storage. I don’t want the shuffle, because I have the old one. But I want to buy an ipod, because I’m fed up with only having 1 gig. 160GB is an overkill for me man! I hope you have enough media to fill that sucker up. I’m contemplating between the iPhone or the iPod Touch. I can get the iPod now or wait till the iPhone reaches Asia. I did the same thing when faced with ipod nano vs touch. I went classic with vid! Don’t regret it one bit! I got the 80 gig and have yet to fill it up! I got the classic also. 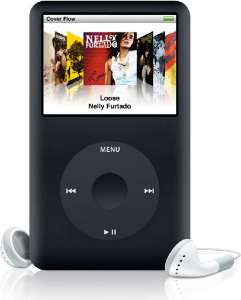 The way I see it, the iPod is essentially a large capacity external harddisk with the capability to play music and video. Oh, I got the 160gb version. 10 gb for my audio. 4gb for audio bibles. Some videos, my installers and other files. 17gb free. Hey, I bought a new classic as well as soon as it came out – 80gig btw, and basically use it as an external hard drive (like African Boy) with the extra ability to play Chaser’s War on Everything episodes (other Aussies will know who they are) and listen to music. This is a fantastic blog post, not thay hard to be able to learn from. Thanks for spending time for you to write about your current thoughts. I only in the near past picked up the ipad tablet pc,havent dug through it to determine all the ins and outs but from what I can see its a fairly first rate little piece of technology. Lol did you hear in regards to the guy shedding the prototype of the model new Iphone lol Apple should Pwn him straight away.